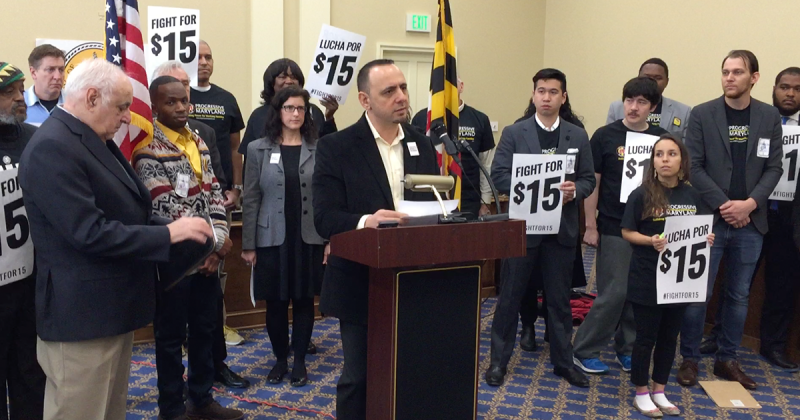 “I’m proud and honored to stand here with all of you today and speak on behalf of Maryland business owners and leaders who, like myself, honor and cherish our workers and believe it is essential that we raise the floor over the next five years so that no man or woman working in Maryland is earning less than $15 per hour. I came to Rockville, Maryland as a 12-year-old boy with my parents, initially overstaying a tourist visa. We started with very little. My father held jobs well below his education for a while, washing dishes and laying bricks. My mother was a teacher’s aide after spending decades running schools overseas. I was very fortunate to live in a state like Maryland, where a quality education and even a subsidized lunch was made available to me. I eventually attended and graduated from the University of Maryland, thanks in part to a Maryland senatorial scholarship. In 1986, my father started a distribution business out of the basement of a rented single story house in Rockville, with my brothers and me as his helpers and eventually his partners. We had some difficult times. Over the next 20+ years, with the hard work and sweat of our employees, our distribution business grew to an enterprise with operations in 33 states, tens of millions in revenue and almost 1,000 employees. It still operates today as part of the Hudson News distribution company. In 2009, my brother and I co-founded iControl Data, which is now based in Burtonsville, MD. We’ve worked hard and we’ve been blessed. Today, our nearly 100 employees, over half of whom work out of our headquarters off Old Columbia Pike, average over $90,000 in salary and benefits, all workers receive stock options, and no one makes less than $17.85 per hour. In fact, as of April 1, when our new budget takes effect, our lowest paid employee will earn $19.23 per hour. You see, it does take hard work and good fortune for a business to be successful. But that’s not all it takes. In my two decades in business here in Maryland, I’ve learned that the best way to build and sustain a company and reduce risk of business failure, is by valuing workers. I’ve learned first-hand that companies are usually far more successful when they have healthy, motivated, respected, fairly-compensated workers. Better yet: Those healthy and fairly-compensated workers are also great consumers, spurring demand for goods and services of all kinds, and driving even more economic activity. That’s how economies like ours, that are 70% consumer driven, grow and prosper. And yet, some companies in Maryland view their workers not as vital, valued assets who deserve safe working conditions and fair wages, but as disposable parts; as just an expense line on their financial statements. Some of these companies earn substantial profits, which we should applaud, but fail to ensure their workers receive a fair share of that success by failing to pay them living wages, counting on tax payers to make up the difference in public assistance to their underpaid workforce and putting businesses who do want to pay their workers fairly at a disadvantage. They put their employees in a no-win situation. This is especially true in a state like Maryland, which has one of the nation’s highest costs of housing and living. It is why I strongly support HOUSE BILL 1416 and SENATE BILL 962 in favor of a $15 an hour, minimum wage, to be enforced gradually over 5 years. Some have said that we can’t afford these wages, and have advocated for a “pause” button. Personally, I am skeptical about the idea of a pause button, which fails to take under advisement that cost of living and housing don’t drop when the economy weakens. In fact, I would argue that weaker economic times are especially critical times to support our most vulnerable workers, who would otherwise need to depend on the largesse of the state. But if we must agree to a pause button, it is vital that any mechanism to enforce is crystal clear, and leaves little room for discretion. Friends, in a little over a month, Maryland will celebrate its 229th birthday. 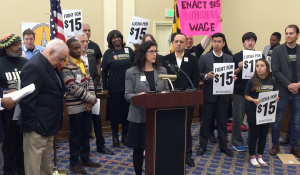 It is unacceptable that in nearly 230 years of history we have only gotten to a $8.75/hour minimum wage for a worker’s time here in Maryland. 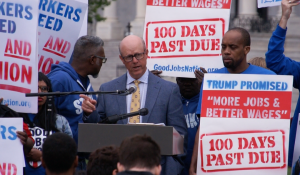 It’s hard for me to see how anyone views a plan that would take wages to $15 per hour over the next 5 years – and 6 for smaller businesses – as a radical plan. I am not denouncing capitalism or betraying business when I say that it is essential to raise our minimum wage. Setting a minimum wage floor is no different to me than the government setting a minimum speed limit on the highway. Both are there not to oppress but for the well-being and protection of the greater community. And as with speed limits, people adjust. If we want to live in a state and country where opportunities are plentiful, and living standards are on the rise, we have to realize a higher minimum wage must be part of the equation. These are not radical principles. These are not utopian ideas. If our goal is to have both a healthy economy, and a healthy society, it’s just plain common sense. As a Maryland businessman, I know that putting more money into the hands of people who will spend it – workers – is better for my business and for our state. You see, there simply is no better way to grow and sustain successful businesses and a strong economy than happy, healthy, motivated, fairly-compensated workers.